Transparency Market Research has released a new market report titled “Automotive Lane Keep Assist System - Global Industry Analysis, Size, Share, Growth, Trends, and Forecast, 2017–2025.” According to the report, the global automotive lane keep assist market is expected to expand at a CAGR of more than 15 % during the forecast period. Rise in awareness about safety among vehicle owners is projected to boost the growth lane keep assist system market for automotive during the forecast period. Accidents triggered especially due to driver negligence or distraction causes damage to both the occupants of the vehicle and the vehicle. Lane keep assist is an active system, which aims to reduce the number of accidents by mitigating the effects of driver fatigue, inattention, or laxity. Rise in demand for passenger safety, increasing focus of governments of several nations to reduce road accidents, and increasing consumer preference for vehicles equipped with advanced safety systems such as lane keep assist system are expected to boost the demand for lane keep assist system during the forecast period. Personal safety and security is a key factor that is expected to drive the global lane keep assist system market during the forecast period. Stringent regulations have been laid down by the European Union, mentioning certain mandatory requirements to be followed regarding lane keep assist system (LKAS). As per these requirements, the lane keep assist system needs to be operational for vehicle speeds ranging between 72 km/hr. and 108 km/hr. The minimum radius of the road for the operation of the LKAS on a curved road is 250m and that for a straight road is 1000m. Increasing concerns about safety by government bodies are providing assistance to lane keep assist system. Based on components, the electronic control unit (ECU) segment dominated the lane keep assist system market, by accounting for a prominent share, in terms of revenue. ECU is a major component of the lane keep assist system, which actuates the electric power assisted steering to steer the vehicle back within the lane, if the vehicle departs outside the lane. The ECU is responsible for the actions performed by the lane keep assist system.. Government emphasis on active safety systems for automobiles is boosting the lane keep assist system market with eminent components. In terms of sales channel, the aftermarket segment holds a major market share as compared to other segments. This is due to the increased awareness about safety systems and frequent replacement of electronic components owing to their shorter lifespan and malfunction. The aftermarket segment is anticipated to expand at a significant growth rate during the forecast period. Based on vehicle type, the passenger vehicle segment accounted for a prominent share of the market owing to the increasing demand for passenger vehicles globally, primarily for local and intercity transport. In 2016, in terms of revenue, the passenger vehicle segment dominated the lane keep assist system market. Demand for lane keep assist system is expected to remain high owing to the higher number of accidents caused in this segment of vehicle. Decline in vehicle loan rate and awareness about advance safety features are providing lucrative opportunities to vehicle consumers to opt for vehicles with active safety systems. Europe dominated the global lane keep assist system market for automotive in 2016. Europe and Asia Pacific are anticipated to dominate the market during the forecast period owing to the high rate of adoption of the technology and rising awareness about safety systems in these regions. This, in turn, clarifies the penetration level in these regions at initial stages, being quite on a higher side than other mass manufacturing regions. The market in Europe is also expected to expand at a significant growth rate owing to safety norms and improved road infrastructure that assists the function of lane keep assist system. Safety regulations imposed by the European Union regarding the testing and implementation of lane keep assist system in the region in order to ensure safety are boosting the auto manufacture’s economy. Europe being the home to some of the major auto manufacturers are upgrading the product in order to provide superior performance. Prominent players operating in the global lane keep assist system market include Robert Bosch GmbH, Denso Corporation, Delphi Automotive PLC., Continental AG, Valeo, and ZF Friedrichshafen AG. 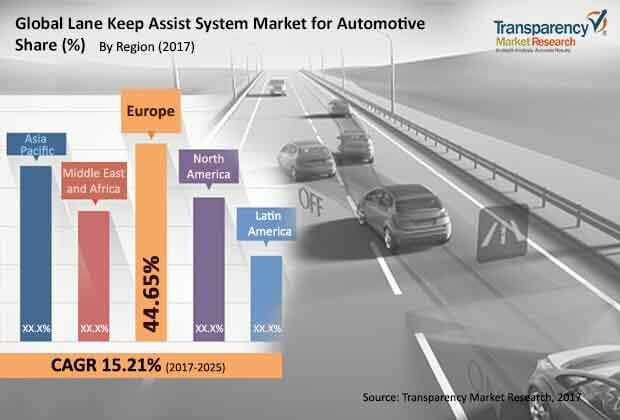 Increasing competition among manufacturers to provide a better product is anticipated to boost the lane keep assist system market during the forecast period. Robert Bosch GmbH is a major supplier of lane keep assist systems. Benefit from the formation of strategic alliances with regional players and continuous upgradation of the technology allows Robert Bosch GmbH to lead the lane keep assist system market for automotive. Expansion and presence of major auto manufacturer countries increases the sales of Robert Bosch GmbH. In September 2017, at the Frankfurt Motor Show, Valeo launched its new invention LiDAR sensor, which ensures optimal and continuous operation in all weather and road conditions by cleaning away rain, mud, snow, dust, and obstructions. Improvement in components such as sensors is expected to enhance the performance of the lane keep assist system.